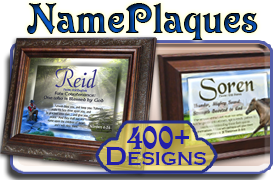 NamePlaques™ with Flower backgrounds, personalize any name on any design. 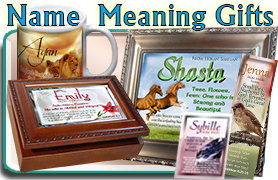 Floral Arrangements, Artfully Revealing the Meaning of your Name. What happier flower is there than the Sunflower? 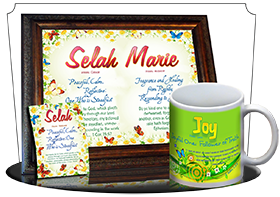 This beautiful green, blue and yellow name meaning plaque is personalized with any name and it's carefully researched name meaning, origin, life meaning, and hand-chosen Bible verse, all in a beautiful array of sunflower-yellow. 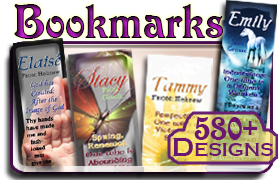 Don't forget to add a matching bookmark to your order for your favorite book! This lovely floral design features an easter lily in the background with a vibrant pink firelily in the corner. The name is in a pink cursive handwritten font, while the meaning and verse are in dark purple and black. 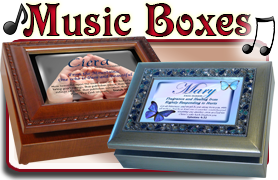 A lovely choice for a memorial plaque, or a keepsake box. This beautiful array of flowers includes bright colors and clear, elegant fonts. 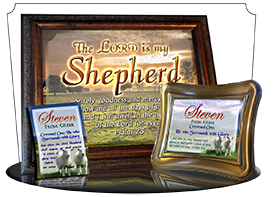 Personalize this print with any name, and we'll provide the carefully researched and encouraging name meaning, hand-picked Bible verse, and a gift that she'll treasure for years and years to come! 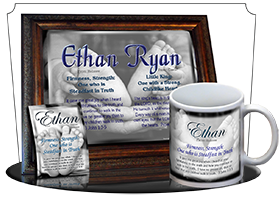 Add a matching bookmark or pocket card to remind her of your thoughtful gift: this framed name meaning print. This lovely purple name meaning gift is called Moon Petals, and is our most popular flower design. The WidePlaque design shows even more details, including an asian tree with violet-purple petals. This secluded glow of blue flowers makes a peaceful message of encouragement. 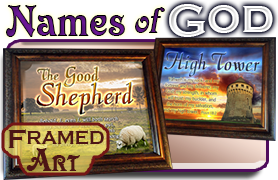 Name, origin, meaning and Bible verse are included in hues of blue, shown here with the name Lily, meaning "Purity: Shining Light" and the verse, John 8:12: "Then spake Jesus again unto them, saying 'I am the light of the world: he that followeth me shall not walk in darkness, but shall have the light of life." Rose petals as soft as dew drops grace the bloom of this pure pink rose. 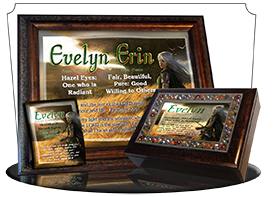 A lovely choice to bless a woman of grace and beauty with the encouraging meaning of her name. The accompanying Bookmark and Pocket card show some beautiful alternate designs that make the gift even more special, with even more roses! White Easter lilies frame the name meaning while a distant cross stands hopeful in the background. 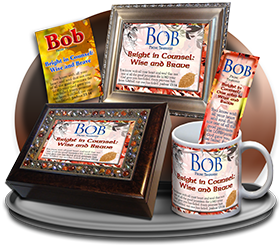 This makes a wonderful plaque for memorials, confirmation, comfort or encouragement. Deep beautiful pink petals draw the eye into this personalized name meaning print. A pink tulip with dewdrops is on the left, with the name and meaning and verse on the right. This is an elegant floral name gift for young women and mothers! Originally, I made this tulip design as as stationary for a letter I wrote to a young lady I was courting. 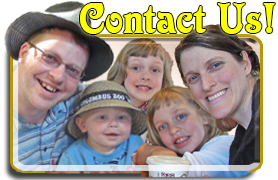 Now married for 10 years, we run CrossTimber together, and have two daughters and a son who all help package name meaning gifts. I guess she liked the letter! 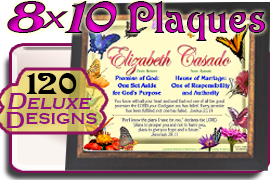 And now it makes a beautiful NamePlaque design for a flower-lover, or yours. The title says it all. Vibrant Purple. This name meaning design emanates with the soft light of the purplish pink flower in the background. 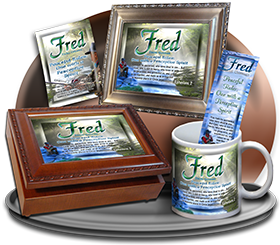 The typeface for the name and meaning are an elegant touch for any message of meaningful encouragement. 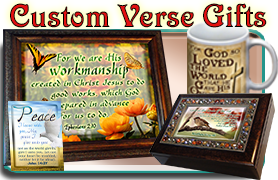 Add a personal touch to your personalized flower gift with an added bookmark or custom inscription! This white daisy glorifies it's Maker with a bright and grateful attitude. 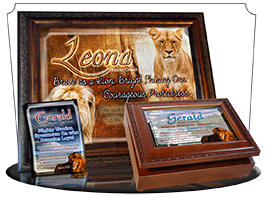 I think it looks best on the Name Meaning Keepsake Box. 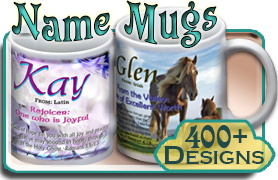 Artistic floral scrollwork borders the meaning of this name. 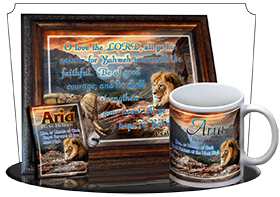 Framed with a colorful printed matte and accented with glowing oranges and yellows. 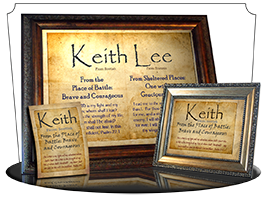 Add a laminated name meaning bookmark or laminated pocket card and present it as a complete set. The greeting card is quite nice, too!